his visual imagination can be found on many record artworks for labels like Aggro Berlin or I Luv Money. Also lots of German Hip Hop- and Popstars like Marius Müller-Westerhagen, Peter Fox, Bushido or Sido have chosen him for their campaigns and press shots. 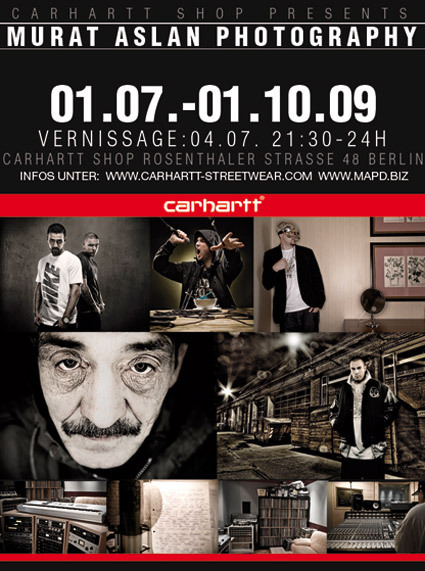 Now Carhartt presents his tasty staged shots for three months within an exhibition in the Carhartt Store Berlin. The show combines his work for artists with aesthetic pictures from Berlin and some touching close-up portraits. The opening of the exclusive vernissage will be celebrated on July 4th.